Which Is Better – Nespresso vs. Dolce Gusto Nespresso Evoluo or Starbucks Verismo, Which To Buy? Nuova Simonelli Oscar II vs. Breville Dual Boiler: What’s The Difference? Heat Exchange copper steam boiler provides high heat for a hot espresso and best steaming/frothing experience. A newly designed, extra-long articulated steam wand. Water reservoir with a sensor lets you know when the water level is low. Touch buttons for a single shot or a double shot, both can be reprogrammed to your preferred volume. Commercial size 58-mm non-pressurized portafilter. Water reservoir capacity: 2.8 liters. Heat exchange boiler allows you to brew and froth at the same time. Click here to learn more about the Nuova Simonelli Oscar II, read the customer reviews and buy it. 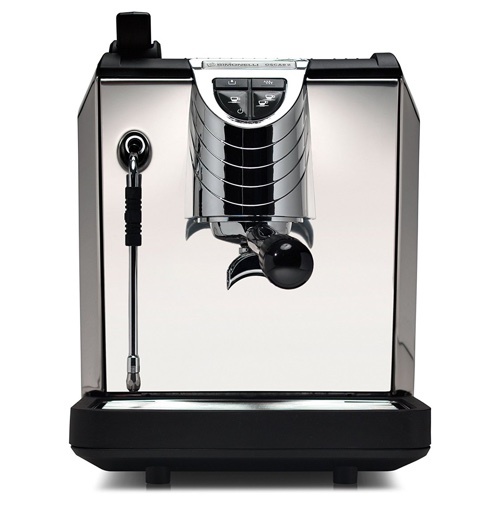 Dual Stainless steel boilers and dual Italian pumps allow you to extract espresso and steam/froth milk at the same time. Electronic PID temperature control offers optimized water temperature. OPV (Over Pressure Valve) limits the extraction pressure for the perfect shot every time. Two programmable buttons for single shot and double shot. Another button for manual brew. Pressure gauge shows you exactly when your machine is ready. Built-in tamper and hot water dispenser. Stainless steel articulated steam wand. Available in colors: Stainless steel, Black or Cranberry red. 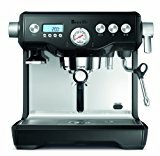 Click here to learn more about the Breville Dual Boiler Espresso machine, read the customer reviews and buy it. What Is The Difference Between the Nuova Simonelli Oscar II vs. Breville Dual Boiler? Program single and double shot buttons for time, meaning you can tap a button and brew for exactly as long as you want! NSF-rated for light commercial use, the heat exchange steam boiler offers ample steam for milk frothing and piping hot shots on-demand. Standing tall at 12'' W x 14.5'' H x 16'' D, the Oscar II's stainless case and modern looks make it a showpiece in any kitchen. A boiler pressure calibrated at 1.2 bars means dry, quick steam perfect for latte or cappuccino quality bubbles. If there’s one thing that these two espresso makers have in common is the fact that both use dual boilers, which means a boiler for espresso extraction and another for milk frothing. So, while single boiler espresso makers require that you wait a few minutes between extraction and steaming/frothing, a dual boiler machine allows you to do both at the same time. The Oscar II has copper steam boiler which offers incredible heat for steaming and frothing. The Breville Dual Boiler has two stainless steel boilers. On the Oscar II, you’ll find two buttons for a single and double shot. These buttons can be reprogrammed to your desired volumes. However, there’s no option for a manual shot. Also, there’s no LCD display for any additional information. The Breville Dual Boiler has three buttons, a single shot, double shots and a manual shot button. The single and double shot buttons can be reprogrammed. You’ll find an LCD display that displays the temperature, shot timer as well as a clock when not in use. There’s also a gauge on the front panel that shows you the level of the steam pressure and when the machine is ready to use. The most notable thing about the Oscar II its extra long steam wand. It is extremely powerful and gives great milk texture in less time. The steam wand on the Breville Dual Boiler is the standard length. The Oscar II has a 2.8L water reservoir with a sensor that notifies you when the water level is low. The Breville Dual Boiler has 2.5L water reservoir and a front facing window where you can see the level of the water. The Breville has a built-in tamper as well as a dedicated hot water dispenser. Both of which the Oscar II doesn’t have. The Oscar II housing has stainless steel sides and front, while the top and back are plastic. The Breville Dual Boiler has a full stainless steel body and plastic top. 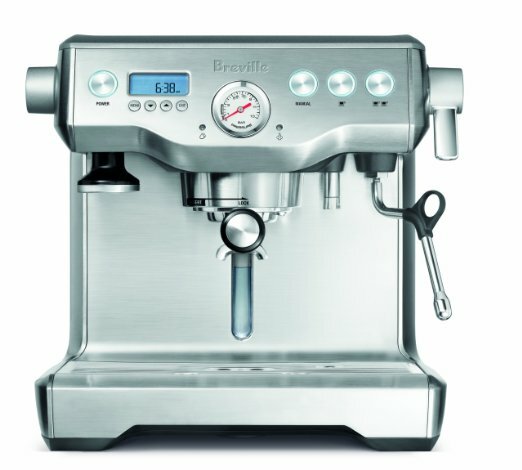 If you need to manually extract espresso, then only Breville’s Dual Boiler can offer you this. Also, if you need a bit of guidance, you’ll like that the Breville Dual Boiler has a pressure gauge, LCD display as well as light indicators. It also has a timer which can pre-heat your machine for you. The Breville Dual Boiler has self-cleaning cycle which is quite helpful when it’s time to clean the machine. You get a built-in tamper and a hot water dispenser as well as a razor dosing tool for precise dosing. The one thing we find the Oscar II is better at than the Breville Dual Boiler is the steam wand. On the Oscar II, the steam is definitely more powerful and will give you the perfect texturized milk in no time.